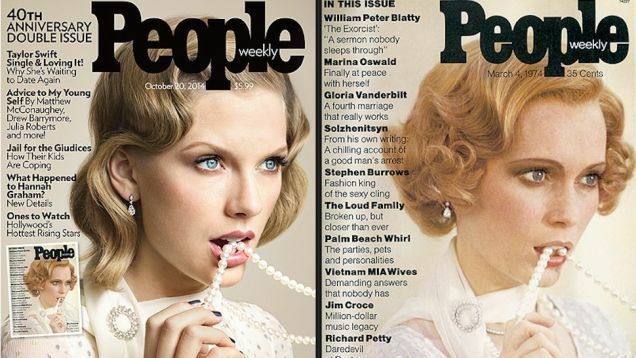 Taylor Swift channels Mia Farrow in People Magazine's 40th anniversary issue. 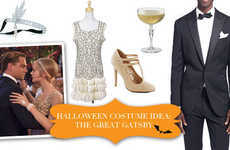 Farrow's covered the magazine's premiere issue as Daisy Buchanan from the (original) film adaptation of the Great Gatsby. With a far-away look in her eyes, a perfect blonde coif and a string of immaculate pearls, Farrow/Buchanan is the definition of poise and grace. Swift possesses a similarly delicate beauty, making her a natural choice to recreate the iconic cover. Farrow's are some big shoes to fill, but I think it's safe to say that Swift's patrician good looks and icy gaze will stop you cold in your tracks! If anything, the cover proves that Swift looks damn good in a set of refined pearls.